Not to worry, we knows! 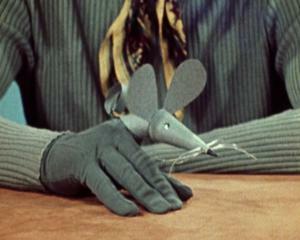 Across the pond, 'Fingermouse' is best known from a '70s era British television series for pre-schoolers. Indeed, once upon a time, finger puppets were genuinely seen as viable television entertainment for kids. This may be the best option so far if I can find a two-piece palm rest to go around it... or do without palm rest at all. We no longer support Chromecast setup on a computer. To set up your Chromecast, please use a mobile device. edit: installed the stupid Google Home app to initialize the device and set the speaker volume to 100%, then deleted it. downloaded a plugin for VLC that controls the Chromecast Audio now - all is well. Aw, the joys of being the tech coordinator for our district's Taxaide program. One site leader insisted on setting up his computers and printers and on opening day he emails that he has a bad printer, couldn't get a downloaded driver to load. Well, dumbshit, the Win10 image we use already had all the drivers installed. It was, literally, plug and print. So my wife (who is the district boss), brings him a new printer and brings home the old one. I plug the old one into a laptop at home and voilà, it works. I told her to be extra sarcastic when she let him know. With a new PC in, I thought I'd try the smaller "Ergo Touchpad" again... Turns out, it STILL has the same problem. it jiggles when my finger did not move, just touched, and when driver was installed, it stopped responding altogether. When I have a malfunctioning program I want to close it immediately. Not wait three minutes so you can report it! working on upgrading the 10-year-old guts of this PC - just had another BSOD today for no good reason. i can probably fix it with a reinstall of Win10, but it's time. keeping the case, power supply, GTX 970 video card, Blu-Ray burner, monitor and all peripherals. Oh great. I decided to walk in history and looked up my postings on Anandtech from 2000. I see I was talking about owning a Celeron 633mhz and overclocking it to 950 mhz. I dont even remember owning this! And now I have yet ANOTHER computer to wonder where the heck it is. And its surprising just how much I knew about hardware back then. I dont even know what some of that I posted is even today. Man. EDIT: It appears I posted on Oct 17 2000 that in 2 weeks I was ordering a Celeron 633, GORB(golden orb cooler) and a slocket . Neat old stuff. OMG wait! I think I saw that GORB cooler sticking on a SLOCKET card and cpu the other year in my old pc stuff. I bet I still have that BH6 and Cel 633@950 in there some place. I looked in my old gaming file as well, which I started back in 1995. It includes games and hardware. I also bought a Tandy PC back in the late seventies but I don't remember the model or processor. And in 2003 I got my first Falcon Northwest and that was my last PC for quite a while. I 'think' my ti4200 was a VisionTek card from Walmart my wife got me. My first X86 PC? Tandy 1000 SL. Took it back and got a 1000 TL (with a 286) 2 weeks later when they told me they don't have the RAM kit in stock and I need 640K to run a Modula-2 compiler. Technically I had a TransWarp kit for my Apple IIe before that, had to return the whole kit and buy a real PC. Was amazed that I can actually run Wing Commander on that machine. i helped a neighbor a couple months back with trying to recover her Quickbooks information off her old laptop PC for her business. my mistake was not negotiating the rate beforehand, relying instead on the generosity of strangers - i made a whole $40 for six hours of work. to top that off, this person neglected to follow any of the advice i gave (update to a slightly newer Quickbooks and then import the data into the online version) and continued to use the PC after i got it running, when i had told her that the hard drive is failing and the information NEEDS to be moved off of it ASAP. so today i get a call from her in a panic because surprise! Windows 7 on that PC has crashed again. she was complaining how she took it to a local computer shop and about 'how much money they were charging'. she wanted me to try to get it running again this time (the only compensation she mentioned was she would make supper for me). i turned it down and told her she was on her own. Alas, no good deed goes unpunished. But once bitten, twice shy. Hypothetically running Spinrite on it may give her a few more months. Or maybe not. But people tend to treat tech support people like **** because "everybody" knows computers nowadays. Hey you fixed it once you can do it 15 more times right? It makes sense to me. Do you have any idea how much dentists charge? What about that.....VisionTek is still around...but all AMD now. Commodore VIC-20 from a yard sale. Tandy 1000 TL (286) traded the SL back as I need 640K to run compiler for school. Generic 486 from a local shop. I guess I'll have to research alternatives. Just install Classic Start / AKA Classic Shell / AKA NeoClassic-UI / AKA Open-Shell and customise your Start Menu so that you can be done with all the daft tile nonsense. I like the daft tile nonsense. I find it to be an efficient way to sort a few dozen frequently used applications where I can find and open them in a single click without cluttering up anything else or doing manual workarounds. If I don't need to launch something, I don't have the start menu open anyway, so none of it is wasted space. I had a blind spot for the tiles. Now that I've unpinned everything on them, I'm a bit happier. With that, 90% of everything I ever launch is one click away and easy to find with big, colorful icons. It's better than desktop clutter or folders and subfolders with tiny rows of text. /edit - and I shrink it down from the almost-full-screen size to just a little larger than the old start menu. Had a motherboard go bad. Was practically an antique but instead of spending a little more for a new chipset and cpu (probably memory too) I found a brand new compatible board on newegg. I tore down the system, cleaned everything, rebuilt it and am now doing a fresh windows 7 install. The updates alone are taking hours. On the plus side everything went exactly as it should (well, there were a few issues but tiny ones) and it is up and running. Kind of a miracle actually. Cable management is better than it was, but still not great. CPU temp is pretty stable in a good place. So, disassembled a PC and built a PC today and everything works. Yay. I use Stardocks' Start10, but I've also used Classic Shell. Both are quite good. I pretty much exclusively use desktop icons, with Stardock's Fences to minimize the clutter aspect of it. Installed games on the left, game platforms on the upper right, random utilities on the lower right and random documents and folders across the bottom. I don't use the start menu for anything but restarting. If I need something that isn't on the desktop (which is exceedingly rare as games and chrome are pretty much it for me on my personal computer), I hit the windows key and start typing. The desktop is my to-do list. This PC and Recycle Bin belong on the desktop. Everything else on the desktop is something that I need to take care of. Dropbox just notified me that I've exceeded my maximum connected devices for my account. Apparently they just released an update that limits you to three unless you have a premium account. I have five. That means that should I ever want to connect another device - say, if I update my phone - I'd have to remove three of them to get back down to two before I could do it. Bye-bye Dropbox. I guess it's time to check out alternatives. Huh, that's weird. Maybe I'm a legacy or something, but I use Dropbox on several devices and also my desktop and laptop. Maybe they only count Android and iOS devices? If so I'd only be at two. It was just rolled out, and i've been using it for a few years now. I just got the same Dropbox annoying message. And I'm annoyed. How do you remove devices? Do you have to do it on the device? Because I'm pretty sure I don't even have all the devices I've installed it on anymore. I'm going to see whether Google Drive is suitable to my needs.